It must be difficult for Missourians to digest the results of the 2012 election without thinking their reputation as a bellwether for presidential campaigns is over. After all, we are talking about a people whose highways proudly welcome visitors to "Missouri: The Show Me State" even though the November outcome paints a vastly different picture. When Missouri's electors convene on Dec. 17 to cast their electoral votes, it will mark the second presidential election in a row their state voted for the losing candidate. What are the state's proudest, most nostalgic citizens to do? Surrender their title to Nevada, which has backed the winner in all but one presidential race since 1912? Acknowledge that Ohio is the new belle of the inaugural ball? Or worse, go back to being just plain old Missouri for the rest of the 21st century? Well, not so fast, Missourians! Rest assured, the road to the White House still runs through your state. It just also happens to pass through Illinois, Indiana, and Ohio as well. The truth is that Missouri's reputation as "The Show Me State" always came with a grain of salt. While Missourians built an impressive record at picking presidents from 1904 to 2004, carrying the bellwether state did not help Adlai Stevenson stave off Eisenhower's landslide reelection in 1956. Before that, the state was carried twice by William Jennings Bryan, a man perhaps best described as the single losingest person in America at the time. President Obama's back-to-back victories put "The Show Me State" squarely back on William Jennings Bryan territory. Even Guam has a better record at picking presidents than Missouri does now. So, what was it that made Missouri so special in the first place? 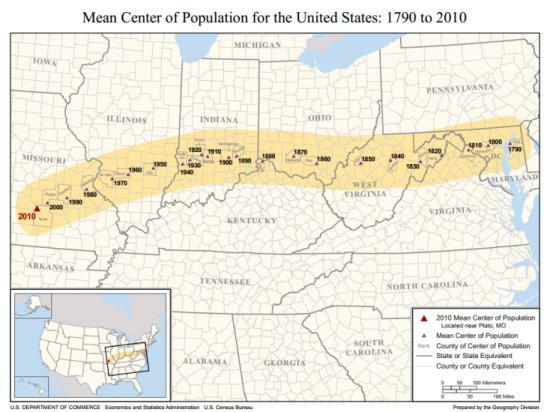 One interesting factor could be its location within the mean center of the U.S. population, a point the Census Bureau regularly designates as the geographic center of the U.S. population assuming the country was flat. Pay close attention to this map, because within it rests the outcome of nearly every presidential election for the last 200 years. There were plenty of stories this year about how no Republican has won the White House without carrying Ohio. Interestingly, Ohio and its Midwestern neighbors have served as the proud home to the mean center of the U.S. population dating all the way back to 1860. How successful has this neighborhood been at choosing presidents? Let's put it this way: Vigo County, a small Indiana locale situated smack dab in the middle of the mean line for every president since Abraham Lincoln, has voted for the winner of every presidential election since 1956, in most cases within 3 percent of the popular vote. This year, Vigo residents narrowly voted for Barack Obama over Mitt Romney by a little under one percentage point. What does this mean for Missouri, the current home of the U.S. population's mean center? Apparently, that "The Show Me State" was never a lone bellwether, but rather the crucial fourth player in an even more crucial bellwether belt stretching from Missouri through Illinois, Indiana, and Ohio. Not only did every Republican president since Abraham Lincoln carry Ohio, but no Democrat since Andrew Jackson was elected president without carrying at least two of these four states. In fact, the only time a Democrat carried two of these four and lost in the post-Civil War era was in 1876, an election more famous for irregularities than for fairness. All examples before that involve the Whig Party, but even then no Democrat secured the presidency without carrying at least two of these four. Such has been the case for every single Democratic president since the party's founding under Andrew Jackson, who decisively swept all four states in 1828. As for Missouri, its residents need not weep for their state's bellwether status as we put 2012 behind us. They are and remain part of this bellwether belt that has decided presidential elections for nearly as long as Missouri has been in the Union. As the current home of the mean center of the U.S. population, perhaps Missourians can take pride in their newfound role as the perennial bellwether -- or head sheep -- that has successfully guided this herd through every presidential campaign from the election of Andrew Jackson to the reelection of Barack Obama. It's either that or go through the unhappy ordeal of correcting their signs to welcome visitors to plain old "Missouri: The State." Jacopo della Quercia is a history writer researching the Lincoln and Taft presidencies for an upcoming book with St. Martin's Press.